I demonstrated the Visual studio, emulator capabilities/ features. An demo on Wp7 app communication with an OData Service, along with a demo on XNA app. 1. What tools does it takes to develop Wp7 app? Are they free? A typical WP7 app can be developed either using Silverlight or XNA. For developers, Visual Studio 2010 is a good choice as it provides an integrated development environment with lots of useful project templates; which makes the task really easy. For designers, Blend may be used to develop the UI in XAML. Both the tools are FREE (express version) to download and very intuitive to use. 2. What about the learning curve? If you know C#, (or any other programming language), learning curve is really flat. XAML (used for UI) may be new for you, but trust me; its very intuitive. Also you can use Microsoft Blend to generate the UI (XAML) for you. 3. How can I develop /test app without using actual device? How can I be sure my app runs as expected on actual device? The WP7 SDK comes along with an excellent emulator; which you can use for development/ testing on a computer. Later you can just change a setting and deploy the application on WP7. You will require Zune software for deploying the application on phone along with Developers key from WP7 marketplace. You can obtain key from marketplace by filling a form. The whole process for registering is easy; just follow the steps on the site. 4. Which one should I use? Silverlight or XNA? Use Silverlight for enterprise/ business / utility apps. Use XNA for Games app. While each platform is capable / strong and may be used in conjunction as well; The methodologies used for development in these platforms are very different. XNA works on typical Do..While loop where as Silverlight works on event based methodology. 5. Where are the learning resources? Are they free? There is lots of stuff on WP7. Most of them are free. There is a excellent free book by Charles Petzold to download and http://www.microsoft.com/windowsphone is full of demos /todos / vidoes. All the exciting stuff was captured live and you can view it here; in case you were not able to catch it live!! @ http://livestre.am/AUfx. My talk starts from 3:19:00 timeline in the video!! Is there an app you miss on WP7? Do let me know about it and I may work on it for free !!! Keep discovering. Keep is Simple. WP7. Great Man. You are doing great. I have been a long term reader of GeekWithBlogs and really enjoying it. 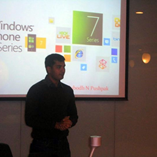 Good To See that you presented on Windows Phone 7 app development using Silverlight. All the best for future plans.